Click here to see some of the feedback on Kotor Muo from our past guests! 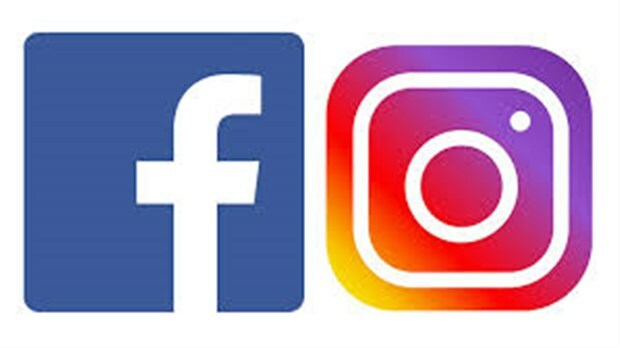 You can also view our Instagram both of which advertise special offers on our properties, Gulet Cruises and lots more. Throw open your curtains each morning to the best view in Montenegro! 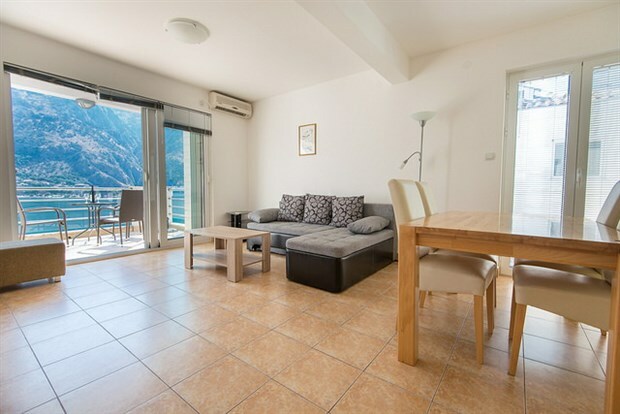 Kotor Muo is an apartment resort with a stunning view onto the UNESCO World Heritage site of Kotor old town. Just 50m from the sea in the quaint fishing village of Muo, these apartments are perfectly located to enjoy Venetian-era Kotor. Wander the ancient alleyways and cobblestoned squares, while away the hours in a café and stay on for the nightlife. Once you’ve strolled back from Kotor around the beautiful headland of the fjord, you can cool off in the pool or relax on the sunbathing piazza. Each apartment has a private terrace, perfect for alfresco dinning - the medieval walls are lit up spectacularly at night. 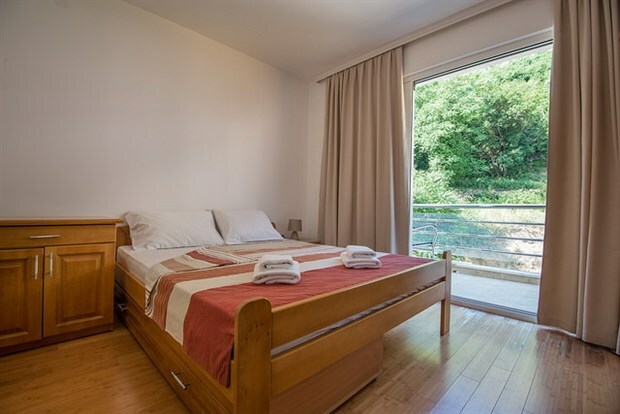 If you can tear yourself away from your terrace, you’ll find the well-appointed Kotor Muo apartments light and airy inside, with floor-to-ceiling glass windows making the most of that view. 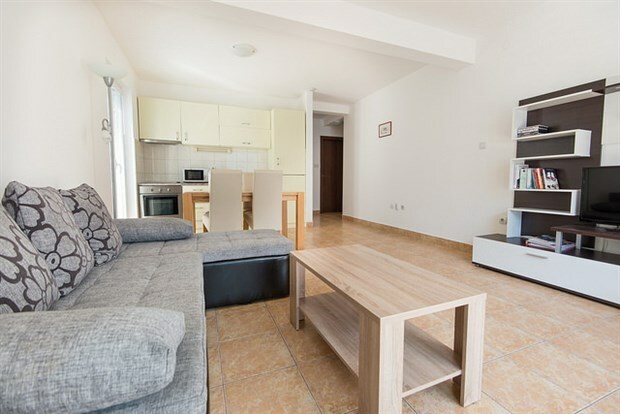 These modern one and two bedroom apartments have a modern style with tiled and wooden floors throughout. 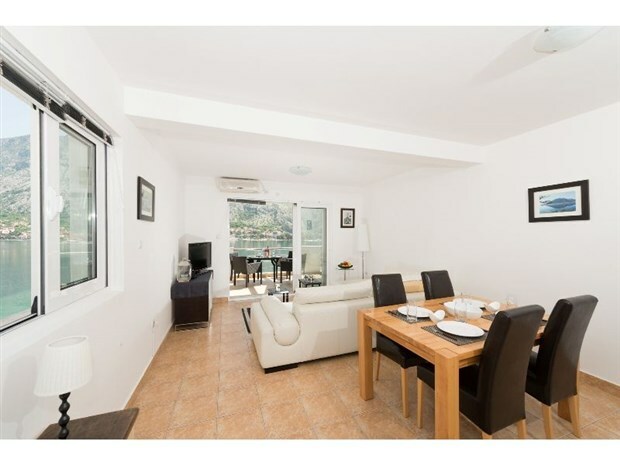 The open plan lounge/kitchen-diners come equipped with a modern fitted kitchen that is perfect for serving up light meals and can be enjoyed on the balcony complete with outside dining. 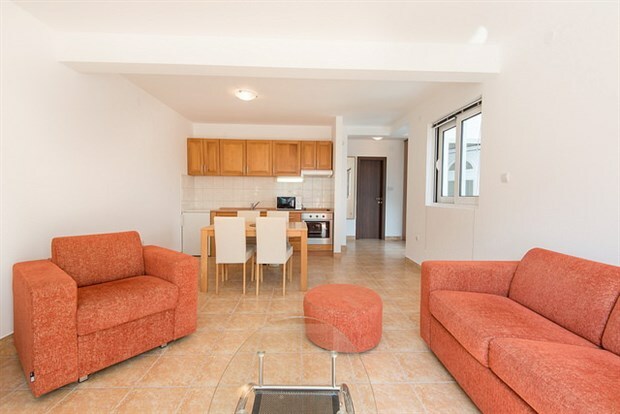 The lounge areas are comfortably furnished, air-conditioned, and have patio door access out to the balcony that has beautiful views of the bay and Kotor Old Town – a great place to relax on those warm summer evenings. Every apartment offers a sea view. Sunny days can be spent enjoying the amazing vistas from the terrace around the pool from the comfort of your sun lounger while deciding which restaurant to choose for that special evening meal. 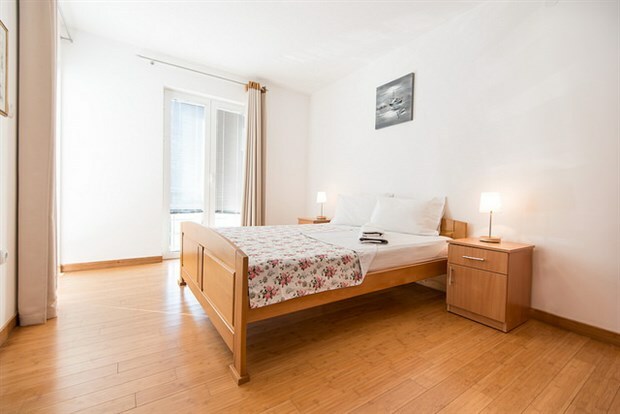 Each apartment has allocated parking, WIFI and air conditioning throughout. It is a 15-20 minute walk into the Kotor Old Town. Inside: Shower room; double bedroom (access to balcony); lounge/kitchen-diner (patio door access to front balcony,, fitted oven, fridge/freezer, 4 ring ceramic hob, kettle, toaster, satellite TV, A/C, WiFi, washing machine). 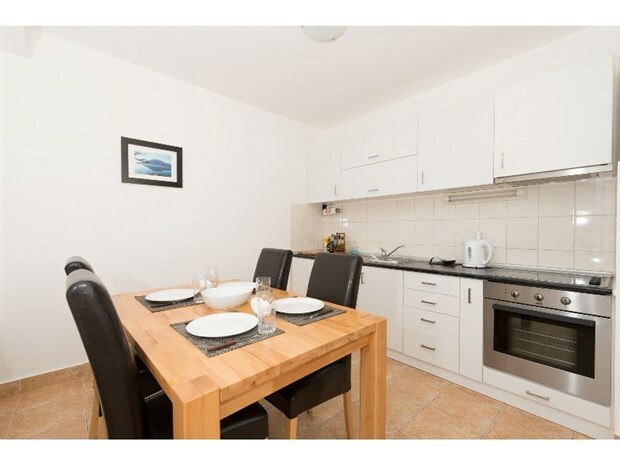 Inside: Bathroom; double bedroom (en-suite shower room, access to front balcony); double bedroom; lounge/kitchen-diner (patio door access to front balcony, fitted oven, fridge/freezer, 4 ring ceramic hob, kettle, toaster, satellite TV, A/C, WiFi, washing machine). 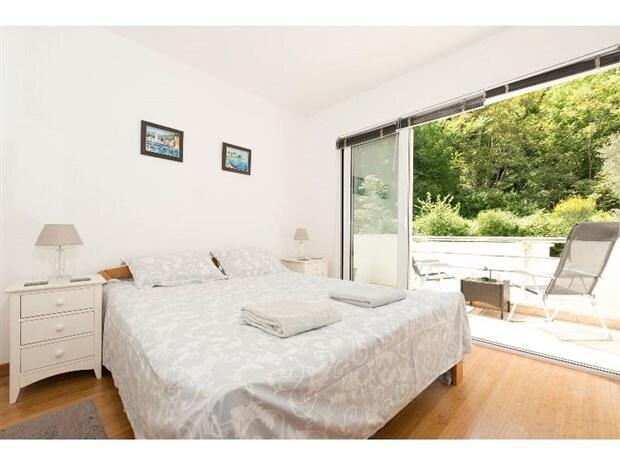 Outside: Balcony with outside dining; shared hexagonal pool around 10m across with sun loungers and parasols; mature gardens; private gated parking. There are around 30 steps from parking to top floor of the building. Tourist taxes are payable locally to your Explore Montenegro representative when you arrive (around €1 per adult per night and €0.5 per child). Often referred to as Europe’s most southerly fjord, Boka Kotorska or Kotor Bay is also one of Europe’s most spectacular destinations. Imagine all the splendour of a fjord – deep waters reflecting the sheer sides of icy cliffs – but in this case the cliffs are breathtaking mountains, the water is warm and the climate is luxuriously Mediterranean. This butterfly shaped expanse of azure blue sea enchants all visitors, who are invariably seduced by the coastal scenery and the charming villages and towns strung along the shoreline. Of these, the old city of Kotor is one of the most impressive and most beguiling, thanks in part to its stunning setting. Exquisitely preserved, its medieval centre is a charming jumble of narrow alleyways, piazzas, churches and palaces, cafés and clubs, bars and restaurants, creating a bustling atmosphere within the ancient walls of the city. The walls, almost five kilometres long, are an attraction in themselves. Built in the twelfth century, they climb 200 metres up the sheer mountain face, forming an impressive backdrop to Kotor’s annual Venetian carnival. The Venetian influence is one that pervades the immediate area – the nearby village Perast is littered with the palaces of seventeenth-century Venetian traders, each vying for the best view over the bay to the beautiful island monastery of St. George. Perast is incredibly pretty, peaceful and perched right on the waterfront, with numerous spots for sunbathing and swimming. There are any number of charming towns to choose from though – from Herceg Novi, right at the entrance of the bay, with its own impressive walls and fortress-studded old town, to picturesque Prcanj, with its waterfront dotted with cafes and churches. Dobrota is one of the most appealing, backed by rocky cliffs that tumble into the dramatic bay, with a long and lovely promenade lined with splendid old palaces. All these seaside towns are so full of charm that it doesn’t really matter which one you choose as a base. In any case it’s easy to explore – and a delight too, given the staggering scenery at every turn. The mountains are a constant backdrop, the sea, warm and sheltered, allows for wonderful swimming, and boats can be hired everywhere. It’s little wonder that this bay, now a UNESCO World Heritage site, has remained a magnet for centuries – for sailors, traders and sightseers alike. Explore Montenegro partners with Feefo to provide feedback on our great selection of villas and apartments. Please click on the link above and you will be taken to the feedback page for Kotor Muo. Please select the number of people travelling and the number of nights from the dropdown menu. Then click on your start date. The price will display below along with an option to add flights. 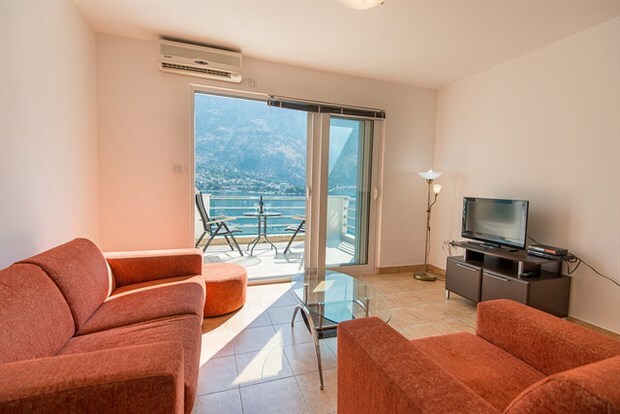 Luxury apartments with pool and stunning views of UNESCO-protected Kotor ol..